Restorativeschools offer a diverse range of training, consulting and professional development opportunities across the education sector and wider community. These involve both scheduled and customised workshops and programmes, directly focused on the needs of the client and their setting. We pride ourselves in our highly interactive, practical approaches, embedded in up to the minute research, designed to meet specific need. With over 40 years of combined experience of teaching, working with young people and with groups of all ages in both New Zealand and abroad, we bring a wealth of experience and skill to this field. See the 'Training Hub' for upcoming training dates and opportunities. Exploring effective learning environments and ways of building strong learning relationships within classrooms. An overview of the restorative philosophy and an introduction to the key principles of restorative practices and the variety of approaches within a school setting. An in depth exploration of the philosophy of restorative practices, investigation of the effectiveness of traditional approaches to behaviour management. Interactive practice based sessions focussing on the different levels of restorative conversations, conferencing and restorative approaches within a school or workplace setting. Developing a vision, a restorative team, and a strategic approach, tailored to schools contexts and cultures. 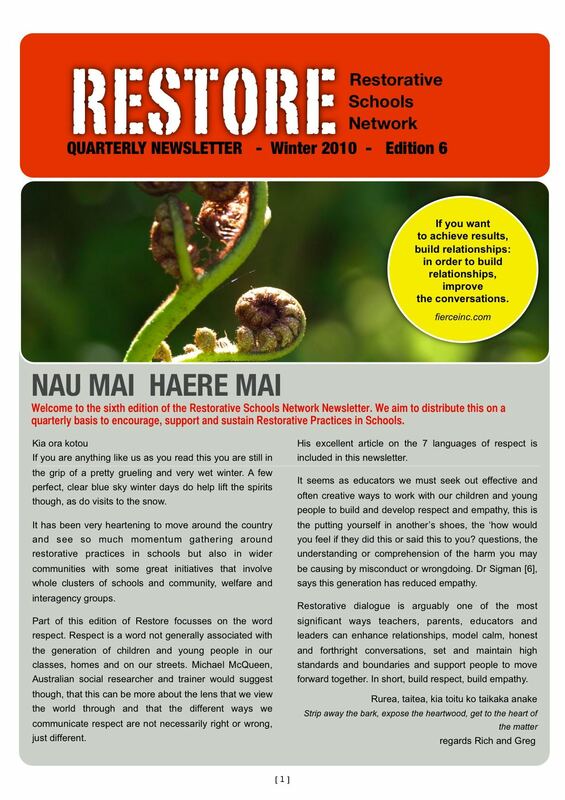 A focus on creating staff buy-in, building relational capacity, and working towards sustainability of restorative approaches in a school, workplace and wider community. We specialise in developing ongoing approaches to professional development and more extensive training packages to meet the needs of your school and workplace in embedding practices and supporting sustainability. Our workshops are highly regarded as some of the best professional development participants have experienced. Participants are consistently inspired to reflect on their practice and take bold steps towards making a difference in their workplaces and communities. Copyright © 2009 Restorative Schools. All Rights Reserved.